Love: A complex emotion that can be described in many different ways. 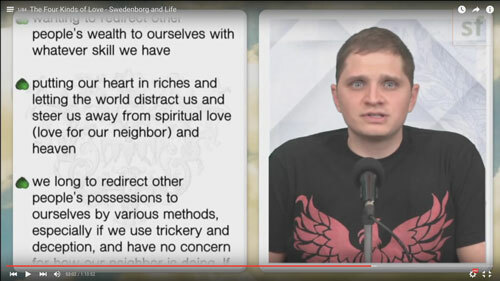 In this episode of Swedenborg and Life, host Curtis Childs and featured guests review Swedenborg’s thought-provoking philosophies about love and purpose. Throughout his many volumes of writings, Swedenborg describes four kinds of love, the role each type plays in our lives, and how we can rearrange them if they fall out of order so that we can get back on the path of happiness and spiritual fulfillment. Swedenborg was so inspired by the love he experienced and witnessed during his spiritual experiences that he wrote an entire book on it called Divine Love and Wisdom. Curtis kicks off the show with a lengthy excerpt from the book to provide some context around Swedenborg’s main philosophy about love—which is that love is our life. The reason Swedenborg places such emphasis on love is because he believes it’s what motivates our every thought and action. Swedenborg actually calls the main motivating force in life our ruling or dominant love—a phenomenon he describes in his book True Christianity, among other places. Though Swedenborg believes a dominant love defines our life and purpose, he describes four kinds of love that exist in all of us. Based on his experiences in the spiritual world, Swedenborg believed there are four kinds of love that exist in everyone at all times and it’s how we choose to prioritize them that defines our purpose and spiritual fulfillment. He outlined the universal categories these four loves can fall under in a short essay he wrote in True Christianity. This compelling animated video excerpt outlines Swedenborg’s idea of the ideal order of these categories. So if all of these different kinds of love exist—some better than others—how can we get them to coexist harmoniously? Here’s a quick animated video clip that describes how the categories of love can be prioritized and arranged in the order they’re meant to be in. Another way to understand the importance of this arrangement is to look at Swedenborg’s philosophy on the levels of the mind. 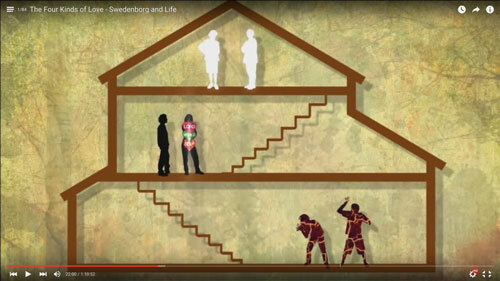 Swedenborg likens the levels of the mind to the three levels of a house. When pure and true love is ruling from the top floor, it leads the other loves from potentially harmful or negative things in the basement to the positive light up there on the third floor. Most importantly, loving yourself more than God or others is a sign of restricted growth. During youth, we’re meant to be inward-focused, but as we grow and gain life experience, we’re meant to share our love outwardly. 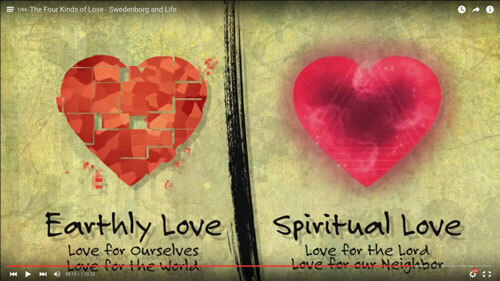 Swedenborg calls love that comes from the inside out heavenly love–and he believes this is the way it’s meant to be. When love for God and others is at the top of your spiritual house, your purpose in life is usefulness because your actions are for the common good. This happens on grand scales and small scales. Even the simple act of cleaning a dish can be an act of love and usefulness for others if your intent is to provide a safe and capable drinking vessel for someone else. Curtis reads an excerpt from Heaven and Hell about heavenly love to explain this kind of love. He then goes on to elaborate on Swedenborg’s definition of heavenly love in this excerpt from Divine Love and Wisdom. Whether or not heavenly love, which is love for God and others, is your strong suit right now, it’s always within your reach. In this profound clip, Karin, a special guest and contributor of the show, shares a personal experience she had that helped her understand Swedenborg’s description of love for God and others—and the unity of the two. If you think you need to do some reordering of the loves in your life, Swedenborg has a quick and easy suggestion to get back on the path of heavenly love, and that is to simply start following the Ten Commandments. Swedenborg defines hellish love as love of self and love of the world (or material things). 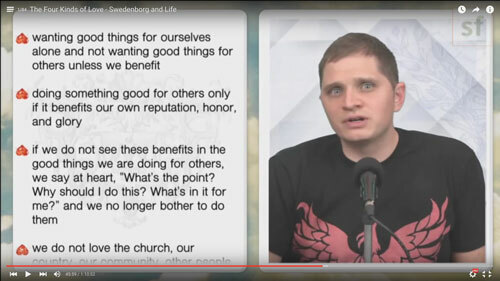 Curtis kicks off this segment by reminding viewers that the kinds of love described by Swedenborg in this section exist in everyone. They have roots in evil but can only affect us negatively if they overpower heavenly love for God and others. To offer a real-world example of hellish love, Curtis introduces a short video clip on how love of self manifests in our lives. He also offers a running list of examples of love of self to differentiate it from self-respect, which is an important and useful quality to have. You see, the problem with self-love is that it manifests through actions that are harmful to others because it does not have the common good at its root. Everyone has a little bit of selfish love within. That’s not the problem. The problem arises when selfish love is in charge, when it’s the ruling or dominant love in your life. Curtis goes on to read an excerpt from True Christianity that explains the consequences of selfish love you might see in yourself and in the world today. By understanding the four kinds of love (two heavenly/two hellish) that occupy our spiritual household, we can start to think about how to bring qualities from all the loves that influence us into the middle floor where we dwell. 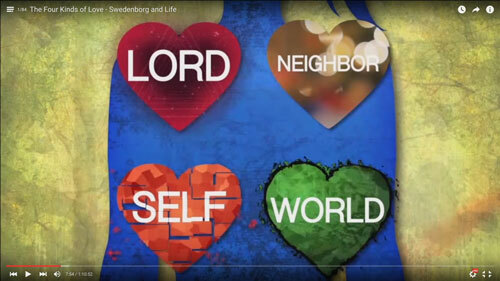 While the two sets of love Swedenborg describes may seem diametrically opposed, there is an element that unites them, as explained in this last clip on the universal categories of love. Yes, usefulness is the common denominator between the four kinds of love because it always brings us into a state of serving God and others. Curtis asks viewers to take one thing away from this episode: Purpose matters. Following a purpose that has love for God and others as the goal leads to a happy and spiritually fulfilling life. If your physical body is composed of cells, your spiritual body is composed of purposes. You have the power to fill your spiritual home with heavenly love, so make sure you have all the right lights turned on! How do we gracefully interact with those who are angry, controlling, etc. without being harmed, especially if we are sensitive? 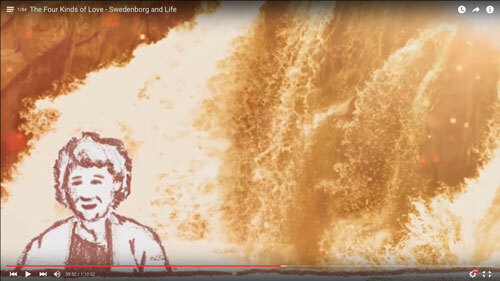 Does Swedenborg say why we are here in this life? How is it that no one in hell is allowed to sin further than they had on earth, but those in heaven can be raised up eternally into deeper love and wisdom for eternity? Could life be a dream? And reality is in the afterlife? What do you think the ratio of good to evil is?